The title says it all, so in no particular order, here are a couple of things I love about living in Thailand. Yep… that’s about how I look too when baking in the sun. 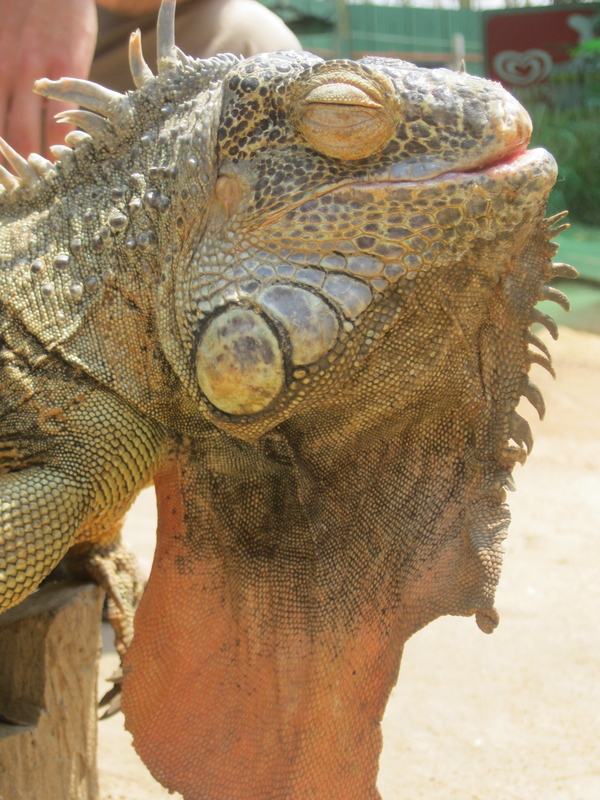 We met this guy at a reptile show in Chiang Mai. He’s not native to Thailand, imported from Mexico. The running joke is that there are three types of weather in Thailand: hot, hotter, and hottest. So if scorching temps aren’t your thing, then this may not be the country for you, but call me an iguana, because in my opinion there’s nothing better than soaking up some tropical rays. There’s never a sunshine shortage in Thailand, and I can count the amount of times I’ve gotten cold here on a couple of sunburnt fingers. When the sun goes down the weather stays warm, and at night it’s the perfect temperature for drinks on the patio, or a game of dominos under the starlight. Mother Nature in action! A mid-day tropical storm, picture taken off my balcony. Thailand does have a rainy season of course, and it can cause problems with transportation and flooding, particularly in the southern areas of the country. The tropical storms are a sight to behold though. Huge gusts of wind, spatters of rain, and loud thunder cracks batter the country, showcasing the fury of Mother Nature. 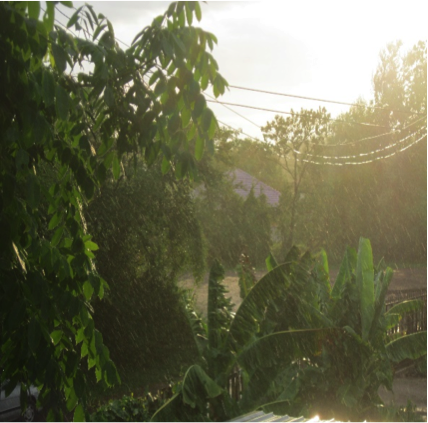 The rainy season can be exhilarating, and the daily showers are usually a nice mid-day break to the stifling heat. The rainy season can be a test of endurance though, the daily rain showers can really start to wear on you after eight wet weeks. Sweet Thai iced teas, sugary green teas, bubble teas, blended fruit smoothies, syrupy soda’s, and cold cocoas are just a few of the delicious drinks sold cold on every road here in Thailand. 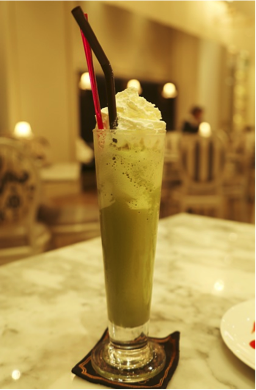 When the sun is beating down on you, nothing beats a sugary iced beverage to lift your spirits and delight your taste buds. For less than $1 American dollar, sweet blended drinks are available on every street corner, making it difficult not to indulge on a daily basis. Although not everyone will share my interest in these creepy crawlers, there are some amazing creatures lurking on the walls here in Thailand. A foot long neon lizard is not an uncommon sighting on the walls of my apartment. 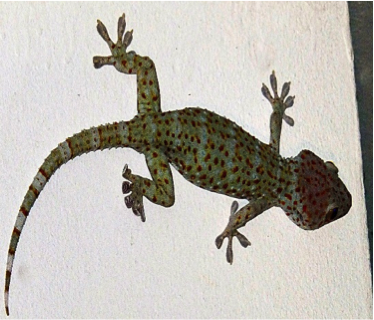 The most common giant gecko here is called a Tokay, and while the first few sightings were alarming, now they are a real treat. These lizards are gorgeous and completely foreign to any commonly spotted wildlife at my home in Seattle. I’ve also seen some amazing snakes, and other large ground lizards outside that I’m glad have never made their way into my room. Fear not though, if reptiles aren’t your thing, there are massive spiders here which are like something out of a nightmare. The Huntsman Spider is one species I have found in my room on several occasions. These suckers are huge, and fast. 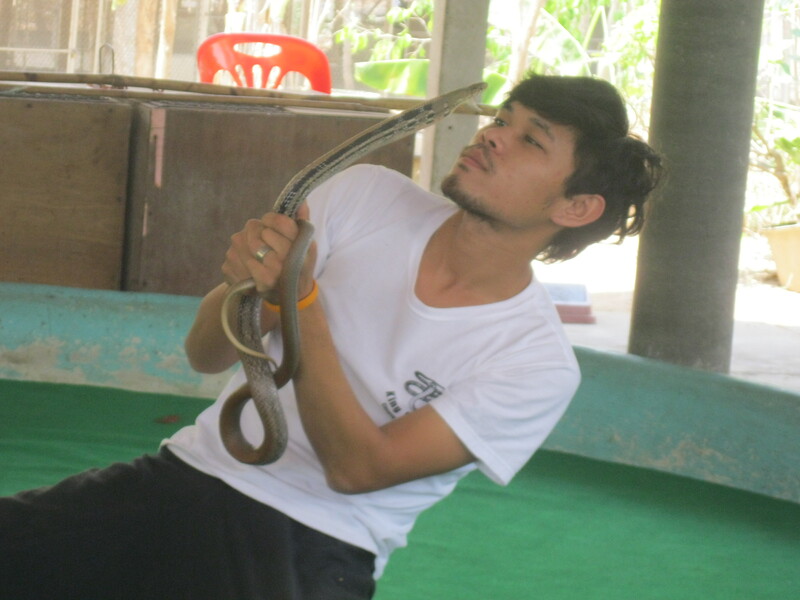 Another picture from the reptile show in Chiang Mai. This dude is crazy, oh and he is missing a finger on one hand. Once my girlfriend went into the bathroom, and not ten seconds later I heard a blood curdling scream. When I ran in, I saw the legs of a huntsman sticking out of the middle of the toilet paper roll! The massive arachnid realized it had been caught, and ran out of the roll. Feeling like Frodo, and acting rather erratically, I grabbed the hygiene gun (commonly referred to as the bum gun) from off the wall, and started spraying the spider towards the shower drain. To my amazement, this sucker moved forward through the pressure of the oncoming water blast. My girlfriend ran to retrieve a flip-flop, and like a scene out of 28 Days Later, she bludgeoned the creature to death. Although we felt kind of bad about killing such a large spider, sleep would have been impossible knowing that colossus was still lurking about our room. Talk about freaky. Thailand is also well endowed with massive red centipedes, snails, and giant frogs, so if you can get past the initial fright, these creatures are an amazing sight. Anyone who researches coming to Thailand will most likely hear about the Thai smile, but it is more than a cultural characteristic, it is a way of life. In Phukieo, Chaiyaphum, where I live, it seems like every passing face has a big warm smile glued to it. People will go out of their way here to be pleasant to one another, smiling, waving, and nodding hellos. While occasionally people in America might greet you with a salting of attitude, here, any attitude away from a positive and friendly greeting is near non-existent. It’s hard not to smile in Thailand. Here’s Boon Boon, our landlord’s 2 year old son, providing the perfect example of a Thailand smile. There’s me demonstrating a standard hand position for a wai. 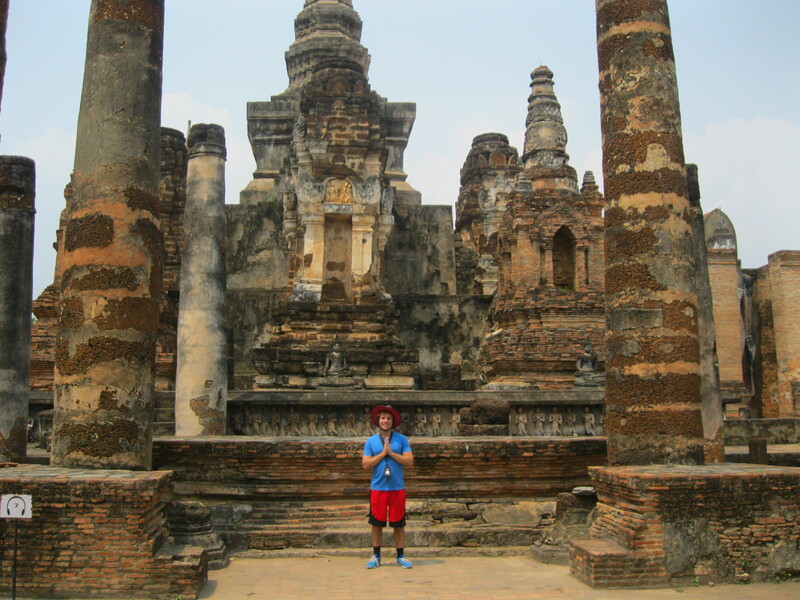 Oh yeah, I’m also standing among ancient ruins from the 13th century (Sukhothai). The wai is the standard form of greeting in Thailand. To wai someone you must of put your hands together in a prayer-like position and bow slightly to the person you are greeting. To me, it seems like there is so much more respect and meaning behind the wai than the standard American handshake. It is truly a humbling experience to really understand the mechanics and meaning of the gesture. 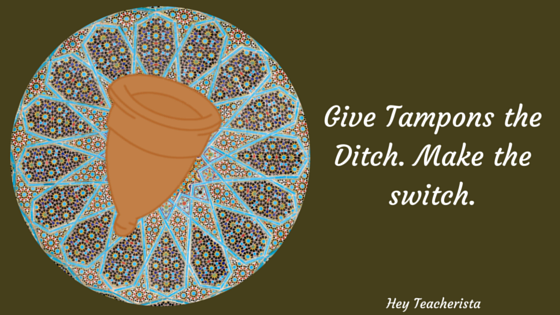 As a teacher in Thailand, students and members of the community are constantly giving me wais. As a foreigner it’s really nice to be reminded of how much the town respects your position and what you are doing at the school. Giving wais to other people also serves as a constant reminder to respect those around you. Almost every town in Northeastern Thailand has a community park at its center, with workout machines and a jogging trail. The park in our town comes alive every night around 5:30 PM. Teachers, policeman, market vendors, students, and everyone else from the town can be seen jogging around the track, doing group aerobics, participating in group sports, and biking around the lake. Besides providing an awesome sense of community, it’s a lot of fun to make your way through the park, stopping to talk to everyone along the way. 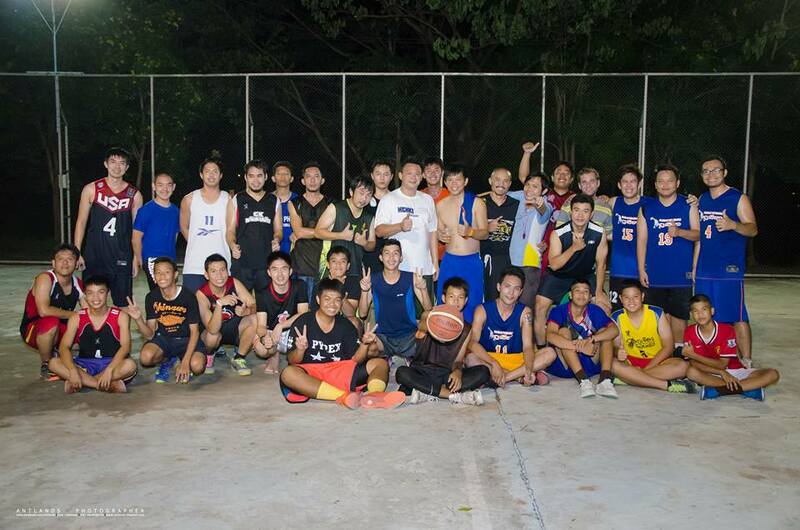 Group picture after a recreation league game in the park. See if you can spot me. I’ll give you a hint… I’m the only non-Thai person. I play basketball at the park in our town a couple nights a week,and even though most of the people I play with speak almost zero English, it is one of the highlights of my week. I really love the sense of sportsmanship that Thais have. Even in friendly park games of basketball in America, there is likely to be at least one person who gets overly competitive or aggressive. Americans also tend to only allow certain people to play in community games, excluding younger people, unathletic people, and often girls. I’m not saying this happens every time, but it does happen. It’s just part of American culture, we are competitive people. While people in Thailand want to win, they let anyone who wants get in on the action play the game, even if it hurts their chances of winning. It doesn’t matter if ten people over thirty years old are hustling up and down the court, if a seven year old girl comes up and wants to play basketball, she’s automatically thrown into the game. In the community park, people just like to play sports for fun, and it shows with the way they cheer on the opposing team, and pass the ball to everyone evenly, even the weaker players on the team. Spending some evening time in the community park is a big part of the culture here, and an awesome experience. 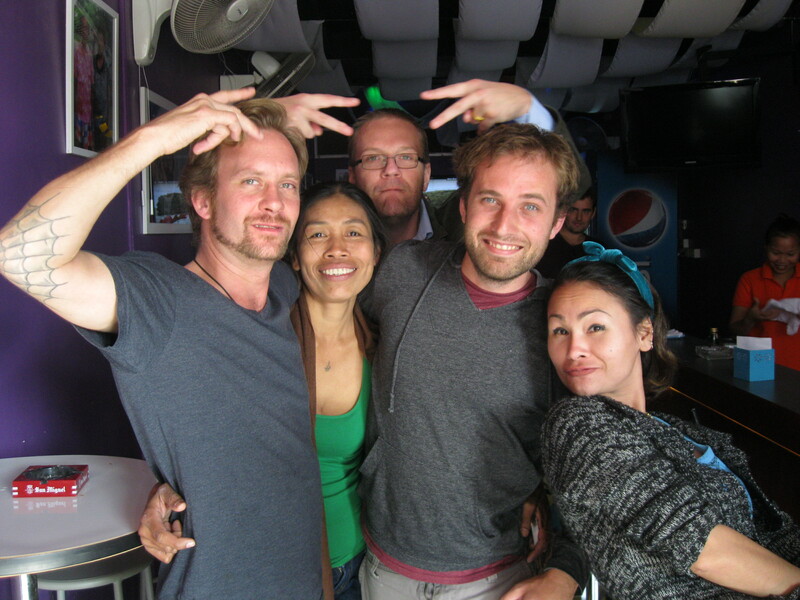 Some friendly expats and natives I met by happenstance on one of my many travels. Although this mainly happens when I travel outside my town, it’s always interesting to talk with other expats traveling and working in Thailand. Whether they are clean cut and well dressed, or dreadlocked and totally granola, every traveler has an interesting story to tell. Other expats are always willing to tell you about an awesome hostel they stayed at, a great bar they just happened to drop by, or why you should or should not spend a month in Cambodia. Through talking with other travelers like myself, I’ve been able to construct treasure maps of awesome locations, recommendations of random foreigners I’ve crossed paths with at bus stations, hotels, or historical sights. So if you come to Thailand, and you happen to run into a 5’8” (5’10” on a good day) handsome American with striking blue eyes, named Justin, don’t be afraid to strike up a conversation and share all your awesome adventures with me! Enjoying a fresh coconut on Koh Chang. Sorry about the terrible view. All kinds of fresh tropical fruit is available everywhere in Thailand, and you can buy a good sized bag for usually under $1 USD. Awesome is an understatement. Fresh Coconuts are no exception, they are plentiful and inexpensive here. Coconut juice is filled with electrolytes and potassium, and I have yet to find a single beverage (well maybe one…) that is as refreshing as chopping the top off a coconut and sticking a straw in it. On a hot day, a coconut is the perfect fruit. There’s plenty more I could add to this list, spicy food, amazing guitar solos, and opulent temples, just to name a few. But I’ll keep it short and sweet. It’s hard not to smile in Thailand. 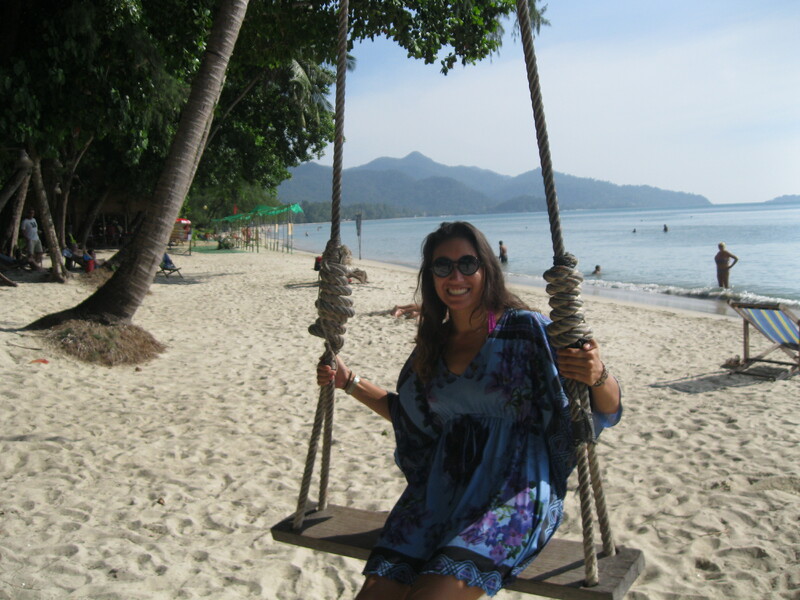 My gorgeous girlfriend Krissy on a gorgeous beach in Koh Chang.